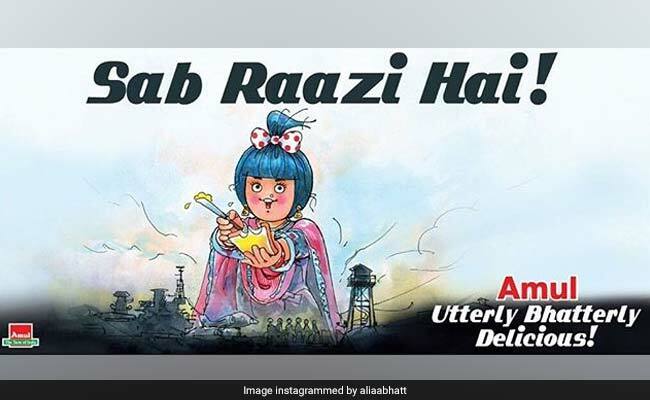 Amul never fails to surprise with its graphic posters and Tuesday was one such day when they shared a reworked poster of Alia Bhatt's recently released Raazi as a new advert. In the advert, the Amul girl can be seen dressed in similar clothes as Raazi's Sehmat and the frame appears to be a rehashed version of when (* spoiler alert *) Sehmat points a gun at her husband played by Vicky Kaushal at the end of the movie. The scene also features in the trailer of Raazi but withholds who Sehmat is aiming the gun at. Amul also appeared to share a review of sorts for the movie and wrote: "Sab raazi hai." The whole thing is just way too adorable and Alia adds to it by sharing the advert on her Instagram with heart emoticons. Karan Johar's Dharma Productions, which produced Raazi, also approved of Amul's review of the movie and tweeted a note of thanks saying: "Thank you Amul, glad to you have you Raazi too!" Alia Bhatt's Gully Boy co-star Ranveer Singh was one of the first ones to applaud Amul's creativity and said: "Wow" in the comments section. The advert, shared on Alia Bhatt's Instagram, has garnered over 3 lakh likes in three hours and has all the potential to go crazy viral. Directed by Meghna Gulzar, Raazi casts Alia Bhatt as an Indian spy who is married off to a Pakistani army officer and planted in Pakistan to transmit valuable information. Raazi is based on Harinder Sikka's book of the same name and is set in 1971. Released on Friday, the film has collected almost Rs 40 crores in four days, as per trade analyst Taran Adarsh's report. #Raazi shows EXCELLENT HOLD on Mon... Decline on Mon [vis-a-vis Fri] is a mere 16.33% - SUPERB... The film has found pan-India acceptance, which is a rarity these days... Fri 7.53 cr, Sat 11.30 cr, Sun 14.11 cr, Mon 6.30 cr. Total: Rs 39.24 cr. 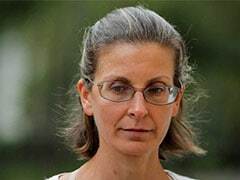 India biz. In his review for NDTV, Raja Sen writes about Alia's performance as Sehmat and says: "With her innocent face and her round cheeks - that bounce with the recoil of the gun she fires - Bhatt really looks the part of the naive little operative, which is what makes it heart-breaking that she can't pull it off as well as she should. There is the constant sense of self-consciousness to her performance, making Sehmat seem like a girl playacting as a spy instead of an actual spy." Raazi is Alia Bhatt's first film with Meghna Gulzar.